Conference information: Conference Program, Book of Abstracts. Media information: Press Release (March 3), Press Release (March 9). Conference videos: Humidtropics on Vimeo. Conference presentations and posters: Humidtropics on Slideshare. Conference pictures: Humidtropics on Flickr. Humidtropics, in collaboration with Dryland Systems and Aquatic Agricultural Systems (AAS), is organizing an international conference on integrated systems research. 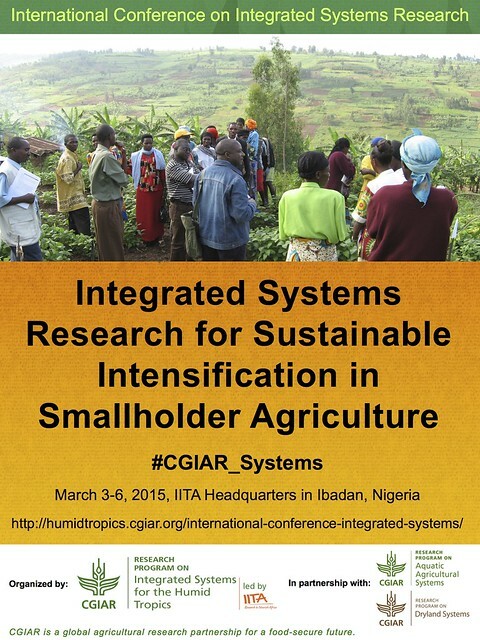 Entitled Integrated Systems Research for Sustainable Intensification in Smallholder Agriculture, the conference deals with major components within systems research in agriculture. The purpose of the conference is to learn from research undertakings on integrated systems, with an emphasis on results: data, methods and lessons learned. The conference took place at the Conference Center of the International Institute of Tropical Agriculture (IITA) in Ibadan, Nigeria, from March 3 to 6, 2015. How to move systems concepts into practice? How do we move to scale and impact with systems research and development? What is the value added of that approach? Why is Systems Research needed to achieve this? Conceptual underpinning: sustainable intensification/systems research. From farm to landscape and further: integration of scales. Future directions: how to take systems research forward? A 25-minute video aired on Friday, March 6, on Nigeria’s Channels TV. This piece, entitled Increasing Food Production Through Systemic Farming is part of the Earth File series, and features Nteranya Sanginga, Kwesi Atta-Krah, Yemi Akinbamijo, Frank Rijsberman, and Ann Tutwiler. You can watch the two-part video on YouTube: Part 1 (12:53 min. ), Part 2 (12:13 min.). Eco-efficient Crop and Livestock Production for Nicaraguan Farmers Humidtropics blog published by Inter Press Service (IPS). A Spanish version was also published by IPS. The ‘unlikely hero’ that transforms lands and livelihoods in Uganda Humidtropics blog published by Devex. Systems Research Recommended for Solving Hunger published by SciDevNet. Transforming IITA to Nourish Africa blog by Frank Rijsberman, CEO of the CGIAR Consortium. Integrating agricultural biodiversity into farming systems is essential Bioversity International news article featuring Ann Tutwiler, DG of Bioversity International. Foresight modelling to guide sustainable intensification of smallholder systems ILRI Clippings news article featuring Dolapo Enahoro’s presentation. Marketing Analysis Confirms the Intertwined Nature of Agricultural Production, Marketing and Natural Resources Management Systems in Uganda Humidtropics blog by Jo Cadilhon of ILRI. Technical Committee: Ingrid Oborn, ICRAF (Chair); Bernard Vanlauwe, IITA; Cees Leeuwis, WUR; Roberto Quiroz and Victor Mares, CIP; Richard Thomas, Drylands/ICARDA; Michael Phillips, AAS/WorldFish; Kwesi Atta-Krah and Eric Koper, Humidtropics/IITA. Guidelines: for poster presenters, for parallel session leaders and presenters. Information: travel advice for participants, list of participants. Top photo: Murambi, Rwanda, by Bernard Vanlauwe/IITA.